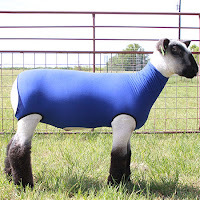 Welcome to The Blue Ribbon - Youth Livestock Projects blog. The purpose of this blog is to provide information, advice and suggestions for improving youth livestock projects from multiple sources. The information, advice and suggestions in this blog come from professional agricultural educators who have multiple years of experience working with youth and their livestock projects. If you ever have a question or a particular subject you would like addressed, please feel free to contact Scott Stinnett via email, or leave a comment and we will do our best to assist or address the subject. Should the question or subject be more technical, we will help direct you to an appropriate resource for the best possible answer. 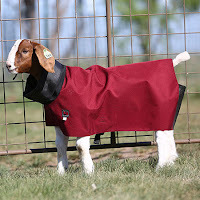 If you have been to a sheep or goat show, you have seen those animals wearing various forms of coverings. They are called socks, tubes, blankets, sheets, and slinkys. Each of these different type of coverings can serve a different purpose or can be used together. So why do we use them? The main reason is because with market lambs and goats, we shear their wool or hair off. This removes the natural layer of warmth and protection they have to better show off their muscling. And since we remove the wool and hair, we need to replace it with layers to help protect them. 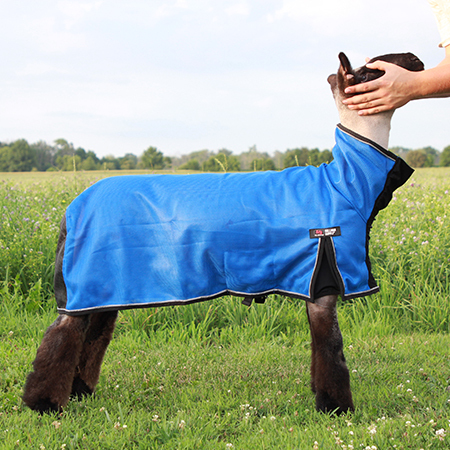 Starting with the lightest, we can use a sheet on hot days to protect their skin from sunburn, biting insects and if we are getting ready to go into the show ring, keep them clean. Tubes are used to help maintain body heat. For sheep, even on a warm day a tube is used to help them maintain some basic heat since they are missing their wool or hair. Blankets are usually made out of heavy canvas or nylon. They are used to provide warmth and protection from things that might tear or rip a tube. Blankets that cover the whole body of lambs and goats help prevent wool fungus and ringworm transfer as well. 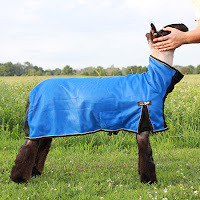 Due to removing lanolin from sheep, and goats being prone to getting fungus, full blankets can help reduce the exposure to these at shows and other times lambs and goats are exposed to new facilities and animals. Layering of these coverings is not uncommon. If you are going to a winter jackpot, your sheep or goat may go in and out of various temperature ranges during the day. Think about a winter jackpot show day. In the morning you load them into a drafty trailer and go down the road for an hour or more in below freezing temperatures. To keep them warm you put on two tubes and a blanket. Once you get to the show, they get to be stalled in an indoor facility that is around 60 degrees, so they wear just the blanket to stay warm and clean. When it is time to head home in the afternoon, it is above freezing, but they still ride in the drafty trailer. A tube and a blanket go on for the ride home. One day and multiple needs for different layerings of tubes and blankets. Two more things to remember about coverings. First, sheep and goats grow and tubes, blankets and sheets need to fit properly. Most blankets are made to fit an animal of a certain weight and species. Sheep tend to be longer backed than goats. Goats tend to be deeper chested than sheep. A tube meant to fit a 50-75 lbs. sheep will be too long and pretty tight around the chest of a goat. A covering that does not fit properly can cause problems. I have seen animals get their legs caught in the straps of blankets that were too big. Ones that are too small usually leave the animal's rump exposed. It would be like sleeping on a cold night without a big enough blanket. Even though part of your body is covered, you will be cold because not all of you is covered. 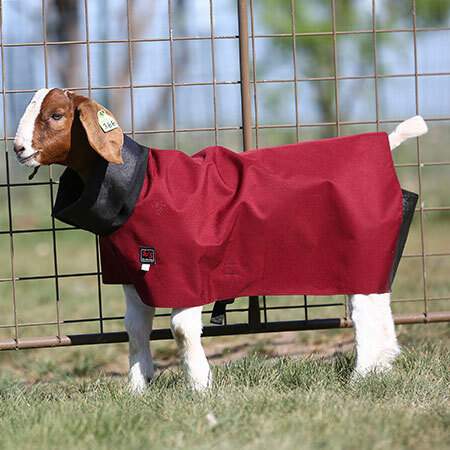 Second thing to remember is although a sheep or goat can only wear a couple of layers at once, they do get dirty. Have multiple tubes and blankets available. When you take off a dirty one, immediately put on a clean one. Most tubes, blankets and sheets can be cleaned in a washing machine with mild detergent. I hope this helps you sort out the uses for the various coverings for sheep and goats. Thanks to J.D. 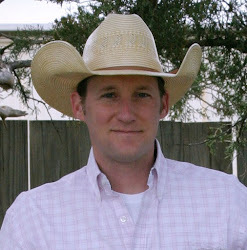 Sexton, 4-H Livestock and Agriculture Agent in Logan County, Colorado for his input on this post. When it comes to the ability of livestock to move and function, structure starts on the ground with the hooves. Taking care of the hooves is as important as taking care of any other part of the body. Each species has its own individual needs for hoof care, but there are some universals to all species. To properly care for a hoof it is important to understand what a hoof is. Cattle, sheep, goats, and horses travel on their hooves which are made of a substance called keratin. It is same stuff that makes up our human finger and toe nails, but is thick enough to bare the weight of the animal. The hoof is a living tissue and continually grows. It needs proper nutrition to grow. Proper nutrition starts with a balanced ration. A ration with proper amounts of protein, energy, vitamins and minerals will keep the hoof growing. Hooves also need proper maintenance. Being a living tissue, the growing hoof needs to be trimmed like human nails. A hoof that has grown too long can cause the animal to have problems walking, create lameness or give a place for infections to occur. Livestock that live in pastures with very sandy or rocky areas can keep their hooves trimmed just by walking. The sand and rocks will naturally grind and sand the hooves down to a proper length. Livestock kept on other types of pastures, in pens or stalls will need to have their hooves trimmed. Sheep and goats can be easily trimmed by the owner. A little education and a sharp pair of hoof trimmers is all that is needed to keep hooves the proper length. Trimming away the excess hoof wall is the main focus. Excess hoof wall can either roll under the hoof or turn out. Rolled under hoof wall can hold dirt and manure, making a great place for an infection or hoof rot to start. Turned out hoof walls tend to split. These splits can continue up the hoof and become cracks in the hoof wall, and another place for infections to enter the foot. Trimming is the easiest way to prevent having these problems. Horse hooves can be trimmed by the owner, if they are knowledgeable, or by a professional farrier. Trimming horse hooves requires a few more tools than sheep and goats. The hooves must be trimmed correctly so the weight of the horse is distributed across the whole hoof. Trimming can be used to help correct minor problems of structure due to unevenness of the hoof as well. This should be done by a professional farrier. Many horses also receive horse shoes. Shoes do many things for a horse's hoof and foot. It provides protection from unnatural surfaces like concrete and asphalt, it helps to distribute extra weight of a rider, and helps give the horse better traction for moving and stopping. Cattle hooves are usually the most difficult to trim. Most beef cattle never have their feet trimmed, but when they do, it requires the use of a hoof trimming table. The hoof trimming table is like a squeeze chute mounted a giant hinge. 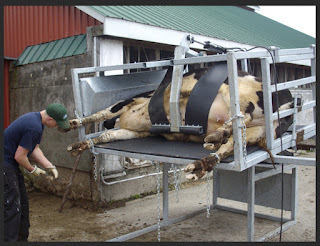 Cattle walk into the table, have their neck and side secured and then the table is tilted laying the animal gently on its side. This allows a professional hoof trimmer to trim their feet easily. Dairy cattle may need their hooves trimmed often due to being kept in pens or on concrete. No matter the species, keeping hooves in good condition requires some observation. Hooves need to maintain a certain amount of moisture. Dry hooves tend to split or crack. Using hoof conditioners and dressings can help to maintain moisture. On the other hand, wet hooves become very soft. Wet hooves are usually caused by animals standing in wet or muddy conditions for several hours a day. Providing a dry place for them to stand and let their hooves dry is the best practice. The main point is you need to take care of their hooves. All their weight is being carried on these sensitive structures. Any damage or injury can cause them pain, lameness and limit their desire to travel. We have all heard the term Biosecurity. Simply put, it is how you keep animals safe from outside diseases. The most biosecure farms have what are called closed herds or flocks, meaning they own all the breeding stock and animals are sold off the farm, but no new animals are usually brought onto the farm. They may even require trucks, trailers and people to be washed before they enter the farm or a barn. This level of precaution may be a little overboard for a 4-H or FFA project, but there are some simple things you can do to provide some biosecurity of your own. Every year we do things that are not the best for biosecurity. We buy and bring in new project animals from different locations. It might be just one or two animals from your favorite breeder or multiple animals from many different breeders or livestock sales. You may not even bring an animal home, but you go to a farm and look at ones to buy, or go to a sale to see people and what animals are selling for. You may like going to jackpot shows. It is a good place for you to work on your showmanship and get your animals adjusted to a show ring, but you are also mixing with a lot of other animals. All these practices could be bad for your biosecurity. How? There are micro-organisms that cause diseases called pathogens. They include bacteria, viruses and fungi. (We will make it easy and refer to them as germs.) Your job is to try and prevent these germs from making it on to your place and to your animals. Here are some tips to improve your biosecurity. Wear work/chore clothes and shoes that have never left home and wash them often, too. These clothes will only have the germs that are on your farm on them. Change clothes immediately after visiting another farm or livestock sale before heading out to see your animals or do chores. You may have brought back new germs from these places. Wash all clothing that has gone to a another farm, sale or to a show. This includes cleaning shoes. You may not know it, but germs and things like a little urine and manure from that other place may have hitched a ride home. Have visitors to your place wear plastic disposable booties over shoes or walk through a disinfecting foot bath. Shoes can hide nasty germs in the dirt, bedding or manure that gets stuck on the bottom of a shoe. Clean pens at least daily. Remove all manure and any soiled bedding. If animals are on concrete, rinse the urine off as well. Germs love to hide in urine and manure. Clean feeders and water sources often or when they appear dirty. Old feed and unclean water can be a great place for germs to grow. Clean up spilled feed to prevent birds and rodents from being attracted. They can bring in some nasty germs. Clean and disinfect pens after a project animals has left for good and before a new animal is introduced to the pen. There could be some nasty germs waiting to greet you new animals. Clean and disinfect any tack or equipment that has left your place. Nasty germs may be hiding on it waiting to get on your animals. Clean out, wash out with soap and disinfect a trailer after going to a sale or show. Quarantine animals who are new or have been to a show until time has passed and they do not show signs of illness before putting with other animals. Wash animals immediately after a show (especially lambs and goats which could have picked up wool fungus or ringworm) before putting them into their home pens. Have individual feeders and water sources. Sharing of germs is not caring. If you suspect you have a sick animal, contact your vet (the one you have a relationship with) ASAP for their professional opinion. Biosecurity is the responsibility of the livestock owner. You are in charge of setting up a line of defense to prevent these unwanted germs from bringing disease to your animals. If you find you are having trouble keeping animals healthy, remember your best resource is your veterinarian. They have the expert training and knowledge in animal health. Thanks to Phillips County Colorado 4-H Agent Kindra Plumb, Yuma County Colorado 4-H Agent JoLynn Midcap and Morgan County Colorado Livestock Agent JD Sexton for their input on this post. When the last year's animal projects have left the barn, we usually take some time to clean up. But what does it mean to clean? For some people, clean is removing the trash, removing old bedding, throwing away old feed and sweeping up. Other folks empty the barn out, fire up a power washer and blast every nook and cranny the barn has. The question is still the same. What is clean, I mean truly clean? I have my way of cleaning around the barn, but this question got me to thinking and doing a little research. I found this source, CLEANING AND DISINFECTION by the National Animal Health Emergency Management System (NAHEMS). These are the USDA people who respond to major animal disease outbreaks. They are the experts in what is clean. Reading through it, there is a lot of technical stuff and if you followed it, you would probably have the cleanest and most sanitary facilities in your county and maybe your state. But for our purposes, let me give you a simplified version of what it means to clean a livestock facility. NAHEMS breaks clean up into two parts, Cleaning and Disinfection. They then break Cleaning and Disinfection into three smaller parts. Let's look at each area. Cleaning is the removal of material items from a livestock facility. The first part is called Dry Cleaning. "Dry cleaning involves the removal of any gross contamination and organic material (e.g., soil, manure, bedding, feed) from production areas or equipment". This is the hard work part of cleaning. Hauling out all the manure, old bedding, shavings, feed, hay, trash and finally excess dirt using shovels, rakes, wheel barrows and brooms. Remember, most of this could be put into a compost pile, but make sure the trash goes to the landfill where it belongs. "...removing any oil, grease, or exudates that may inhibit the action of disinfection". Why do we wash before we disinfect? The things washing removes allows the disinfectants to do their job better. Once everything has be given a good soapy scrub, its needs to be rinsed and dried. Rinsing should remove all the detergent or soap and the final few pieces of stuck on manure, dirt, bedding and other organic matter. And now we can get to the easiest part, Drying. Just gather up all your cleaning supplies and let everything air dry. "Whenever possible, surfaces should be allowed to dry completely (if possible overnight) before application of a disinfectant". You read that right, take a break until tomorrow. Go get your wet clothes changed, make some popcorn, watch a movie with friends and relax until tomorrow! When everything is dry, it is time to disinfect. Now depending on what you decide to disinfect with this may be a job for the adults. Consult your veterinarian, the one you have the VCPR (veterinary client patient relationship) with. Ask them what they recommend as a disinfectant. Different disinfectants work better for different species of livestock, facility types and on different micro-organisms (the things that causes diseases). Disinfectants need what is called Contact Time. This is the amount of time needed for the disinfectant to do its job and kill those nasty micro-organisms that can make your animals sick. The disinfectant should say on it packaging what the necessary contact time is. Once Contact Time has passed, get the rubber boots out again because its time to rinse again. Make sure all the disinfectant is completely rinsed off. When you feel it is all gone, time to let it dry again. This is a lot of work and may be one of those weekend projects if your barns and facilities are big. But this process can be applied to smaller projects as well. Think about all your tack and equipment. Does it need to be cleaned and disinfected? Cleaning and disinfecting tack and equipment can help prevent the spread of a contagious micro-organism from animal to animal. Why would someone go to all this work? Have you ever had to deal with a contagious disease or infection with your animals? Think about ringworm, wool fungus, coccidiosis, scours or worse problems. All are contagious but good sanitation can help to control the spread. I hope you keep clean facilities for your livestock and you take time to clean them thoroughly between each new set of animal you bring in. A little extra time and effort now could prevent a lot of trouble in the future. All content of this blog is owned by Colorado State University Extension.